At Kelperland Veterinary Centre, we are fully equipped to offer a wide range of operations. Meet Rosie (and her wagging tail!). She was rescued by the Monk family from Bulgaria where she was a street dog. She has a lovely nature and was settling in well to her new home when suddenly she started having blood in her urine, so she came down to us for a check up. Simon could feel a firm circular object in her abdomen, so she was booked in for further tests the following day. 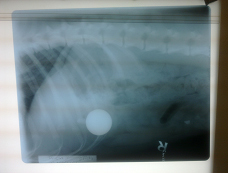 The x-ray shows a white circular object in her abdomen. 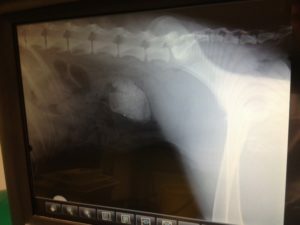 It was assumed that this was a bladder stone – not uncommon in dogs and an obvious reason why she might have blood in her urine. So Rosie was given a general anaesthetic and Simon performed exploratory surgery. 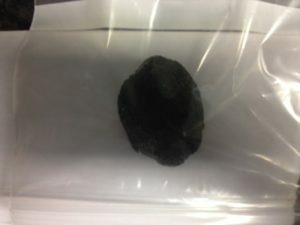 Unfortunately it wasn’t a bladder stone. It turned out to be a large circular blockage of material stuck in Rosie’s intestine! The blockage had damaged the lining of the intestine and the body had cleverly “bandaged” this back up by “sticking” the bladder to this bit of gut to stop it leaking. This had worked very effectively as there was no infection in the abdomen, but it did mean that the bladder was stuck to the gut, which is why she had blood in her urine! So, over the course of a two hour operation, Simon had to gently “unstick” the bladder and the gut from one another. The uterus had also got entangled in this mess, so this needed separating as well. Thankfully the bladder did not appear seriously damaged. Unfortunately this left the large blockage in the intestine – this had to be removed and with it the piece of intestine which it was in, and two new ends of intestine sewn back together in its place. Inside the intestine was this hard ball of matter consisting of hair and food all compressed together into a solid structure far too big to pass normally through the guts. It is always very serious when this is required as this junction of intestine has to heal quickly and not leak, otherwise serious complications can result. Rosie was eventually woken up from her operation and given lots of painkillers to make her comfortable. The street dog in her meant that as soon as we offered her some food she gobbled it down very gratefully! This is very important as this food will go down into the new join of intestine and help it heal quickly. Two days later Rosie left our care to be looked after at home by her family. She has made a miraculous recovery and is now as good as new! Can anyone guess what is in Toby’s stomach? We sometimes find that dogs and cats eat something they shouldn’t such as socks or toys, which can get stuck in the intestines and cause a blockage. These items can be difficult to diagnose on a radiograph but with Toby here the diagnosis was surprisingly simple: he had eaten a golf ball the week before! 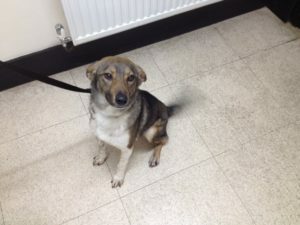 The owner suspected a problem as he had been vomiting for the past week, despite being very well in himself. The ball can clearly be seen as the white circle sitting in the stomach in the picture. Luckily this was easily removed and he recovered very quickly – we advised walks away from golf courses in future! Have you heard about Pet Club? It’s a great way to keep your pet healthy and spread the cost of all preventive treatments. Who to contact in an emergency?